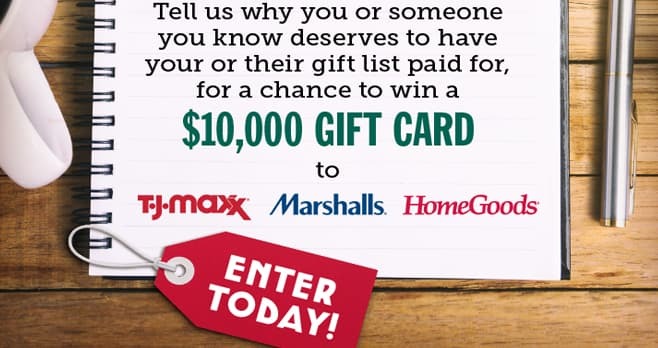 Tell LIVE Kelly And Ryan why you or someone you know deserve to have your or their gift list paid for during the Holi-Yay Shopping Spree Contest for a chance to win a $10,000 gift card to TJMaxx, Marshalls, and Home Goods. The LIVE Kelly And Ryan Holi-Yay Shopping Spree Contest is only open to persons who are permanent legal residents of the 50 states of the U.S. and the District of Columbia (excluding Guam, Puerto Rico, and all other U.S. territories and possessions) or permanent legal residents of Canada (excluding the province of Quebec) who are currently physically located therein, and who are eighteen (18) years of age or older as of the date of entry. The Sweepstakes begins on November 29, 2018 at 9:00 a.m. ET and ends on December 7, 2018 at 9:00 a.m. ET. Limit one Entry per person/per email address during the Entry Period. The grand prize consists of a TJMaxx gift card in the amount of $10,000. Visit https://kellyandryan.com/uncategorized/enter-holiyay-shopping-spree/ to enter and see Official Rules for details. I am nominating my husband to get this shopping spree this year. He is a great guy who has had a few ups and downs and his great attitude about life is why he deserves this. In 2006 over about a 5 month span he lost his mom, sister and brother. That left his aging father but Rod being the kind man he is he… Packed us up and we moved into live with my father in law. This was so that he could enjoy the rest of his days at home. It truly was one of the most rewarding experiences I have had. Rod never complained and because of these things he does I think he should have this opportunity. Just in case your wondering if he knows about this nope he is at work today. You see not only did he take care of his dying father he takes care of me too! I think I deserve to win this shopping spree because I have spent a significant portion my widow’s pension and my savings to support 2 of my sons this year who were partially unemployed due to illness for seven months of 2018. As a result, I won’t have any money to shop for Christmas gifts for anyone,especially my grandkids. I watch everyday,, and was so happy to see this contest. I have 2 great grandchildren 3and 4 their Mom Erin has been hospitalized since May 19,2018, Erin is in Hartwick head rehabilitations center in NJ. He husband does so much for his wife and Kids. Heist butcher at a food store. Missed a lot of work standing by his family. We all try to help with these beautiful children. They surly don’t have Christmas money or saving after this tragedy. The boys names are Christino and Carmelo. I am a big fan of the show. So nice you are doing this contest. They are the sweetest boys miss there Mommy so much. I have11 grandchildren, and these two Greatgrand childre. God Bless, Merry Christmas. Please don’t forget about my family. Two little boys, great grandchildren. There mom is in a rehabilitation center, she can’t talk or share anything with these little boys. They can only hug and kiss her. Erin there’re mom is in this hartwick hospital.bedridden .boy do they need this. Please make the boys 3&4 have a God Bless You kinda Christmas ??? ?